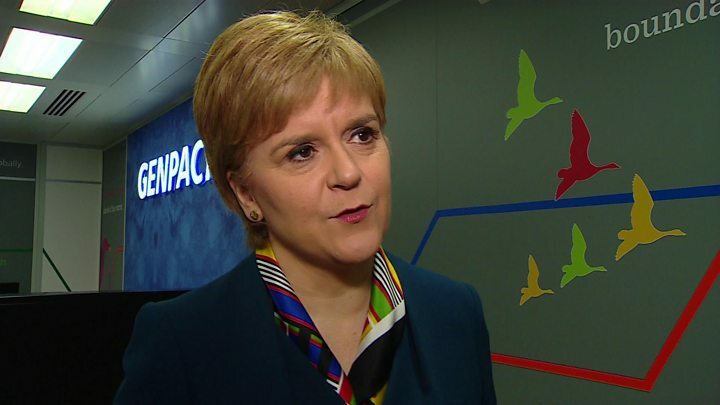 Media captionNicola Sturgeon says unanswered questions on Brexit mean the triggering of Article 50 is a "leap in the dark"
The prime minister has taken a "leap in the dark" by triggering Article 50, Scotland's first minister has claimed. The letter signed by Theresa May that formally begins the UK's departure from the EU has been delivered in Brussels. Mrs May is telling MPs that this will mark "the moment for the country to come together". However Nicola Sturgeon said the prime minister still could not answer basic questions about what Brexit would actually mean. Mrs May's letter to European Council president Donald Tusk was delivered by the British ambassador to the EU, Sir Tim Barrow, at about 12:20. Addressing the House of Commons as the letter was handed over, the prime minister said Brexit would lead to a "significant increase" in the powers of the UK's devolved administrations, including the Scottish government. 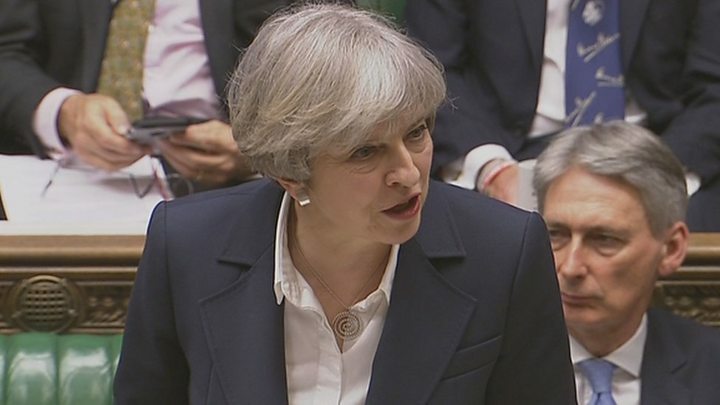 Ms May also promised to "represent every person in the whole United Kingdom" during the negotiations - including EU nationals. She added: "It is my fierce determination to get the right deal for every single person in this country. Media captionTheresa May: "It is the expectation of the government that the devolved administrations will see a significant increase in their decision making power." The letter to Mr Tusk makes one mention of Scotland in its six pages - saying that the government "will consult fully on which powers should reside in Westminster and which should be devolved to Scotland, Wales and Northern Ireland" after they return from Brussels. The letter adds that "it is the expectation of the government that the outcome of this process will be a significant increase in the decision-making power of each devolved administration". Speaking as she confirmed more than 300 jobs will be created over the next five years by a global professional services firm in Glasgow, Ms Sturgeon told BBC Scotland that she hoped Brexit "goes well". But she predicted that the formal triggering of Article 50 would bring "a lot of concerns for a lot of people". Ms Sturgeon added: "There is no doubt that what is happening today does represent something of a leap in the dark. "Some nine months after the EU referendum, the prime minister still can't answer basic questions about what Brexit will mean for businesses, for the economy generally, and for the type of society we live in." At the same time as the Article 50 letter was delivered, the Scottish government received a letter from Brexit secretary David Davis responding to the Scotland's Place in Europe paper of options laid out by Ms Sturgeon in December. It highlighted some common ground between the governments, but said the proposals put forward were not workable. The first minister, who had talks with Mrs May in Glasgow on Monday, said the letter amounted to "a dismissal of our compromise proposals". And she said there had not yet been any commitment from the UK government that powers over areas such as fishing and agriculture would be returned to Holyrood rather than Westminster after Brexit. For Nicola Sturgeon, Article 50 brings both challenge and opportunity. To be clear, she believes that quitting the EU is a calamitous mistake, particularly as it involves leaving the single market. Failing which, says the first minister, she wants the powers to hold a further referendum on Scottish independence. The first minister is adamant that she is genuinely seeking compromise within the ambit of the UK. Her rivals say otherwise: that she has engineered conflict and always intended to move to a referendum. The first minister also confirmed that a letter asking the UK government for talks over a second independence referendum would be sent later this week. Ms Sturgeon said the letter would "set out the expectation of the Scottish government that the will, the mandate, of the Scottish Parliament should be respected, and it will seek sensible, grown-up discussions with the UK government." She said she agreed with Mrs May's assessment that "now is not the time" for a referendum, but added that when the terms of Brexit were clear it would "the time for Scotland to have a choice about its future rather than having that future imposed on us". Scottish secretary David Mundell said on Tuesday that the UK government would not enter into any discussions about a referendum "during the Brexit process". He said this could include the negotiations with the EU, any potential transitional measures, and also "significant implementation time" afterwards. But Ms Sturgeon insisted that the UK government's position was unsustainable, and "will be shown to be unsustainable over the weeks and months to come". The Scottish Parliament voted by 69 to 59 in favour of seeking permission from the UK government for a referendum - with Ms Sturgeon's minority SNP government being backed by the Scottish Greens. But the Scottish Conservatives, Labour and Liberal Democrats voted against. Scottish Labour leader Kezia Dugdale said the triggering of Article 50 was a "deeply divisive moment in our country's history" and would have a "seismic impact on Scotland's economy, risking thousands of jobs and livelihoods".